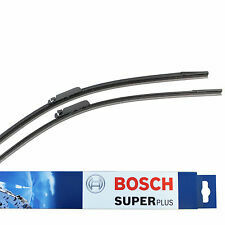 NEW Genuine BOSCH Aerotwin Front Wiper Blades Set A958S. The Aerotwin Performance flat wiper blades convince with elegant, flat styling and optimum functionality. Due to excellent performance, more and more vehicle manufacturers prefer the Aerotwin technolgy. Seat Altea XL 1.9 TDI. Make: Seat - Model: Altea XL - Engine: 1.9 TDI - Style: MPV - Year: 5P5 [2006-2013] MPV. Wiper Blade Details. Wiper Type: Multi Fit. •Exclusive wiper structure. Wiper Blade Features. Seat Altea XL. Front Aero Wiper Blade Set. Easy Fit - Using IGA-1 connector. 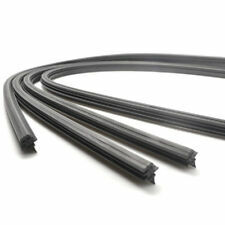 Product: Front Windscreen Wiper Blades Exact Fit Aero Blade. Make: Seat. Position On Vehicle: Drivers & Passenger. Left hand drive cars have door mirrors fitted at a slightly different angle therefore creating the chances for blind spots if fitted incorrectly. Manufacturer Part Number: H595. Model: Altea XL. BOSCH WIPER BLADES & AEROTWIN > REAR SUPER PLUS BOSCH WIPERS. Wiper Length/s (mm): 280. Part Type: Wiper Blade. Wiper Type: SUPER PLUS. Make: SEAT. Warranty Period: Manufacturer Warranty if applicable - See Bosch website for more details. Seat Altea (Incl. To Fit:Seat Altea (Incl. Part:Standard Rear Wiper. Rear Wiper:TRB720 - (28cm \ 11in). Fits Years:2009, 2010, 2011, 2012, 2013, 2014, 2015, (09, 59, 10, 60, 11, 61, 12, 62, 13, 63, 14, 64, 15). ). 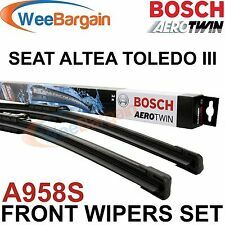 NEW Genuine BOSCH Aerotwin Front Wiper Blades Set A958S. Length 1: 650mm/26"; Length 2: 650mm/26"; Quantity Unit: Front Set; Styling: BOSCH Aerotwin (flat). SEAT ALTEA - ALTEA XL - TOLEDO III ( model 5P ). Wiper Blade Set. OE style blade design for best quality. Key Features. Integrated rear quick clip connections for simplified installations. Left hand drive cars have door mirrors fitted at a slightly different angle therefore creating the chances for blind spots if fitted incorrectly. 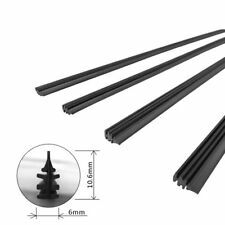 Product: Rear Window Screen Wiper Blade. Make: Seat. Most goods processed with 24 hours for dispatch. One Pair Of Quality Evolution Wiper Blades. 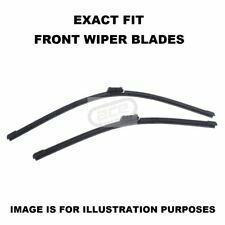 Front Specific Fit Windscreen Wiper Blades Pair X2. Seat Altea (Excl. To Fit:Seat Altea (Excl. Bracketless Bosch Aerotwin windscreen wipers can be seen on more and more new models. Bosch was the first to market with a bracketless wiper blade - Aerotwin. ). SEAT ALTEA (5P1) 1.2 TSI MPV Petrol 04/2010 on FWD 8 105 77. SEAT ALTEA (5P1) 1.4 16V MPV Petrol 05/2006 on FWD 16 86 63. SEAT ALTEA (5P1) 1.4 TSI MPV Petrol 11/2007 on FWD 16 125 92. SEAT ALTEA (5P1) 1.6 MPV Petrol 03/2004 on FWD 8 102 75. Seat Altea (Incl. To Fit:Seat Altea (Incl. 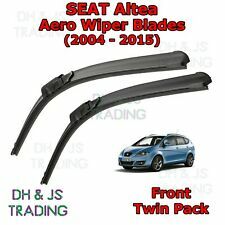 Rear Wiper to theSeat Altea (Incl. Rain and dirt quickly turn the rear window into a visibility and safety risk. With Bosch wiper blades, you are sure to have a clear field of vision ). 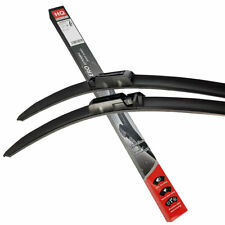 HEYNER Germany®windscreen wiper blade. HEYNER REAR FLAT windscreen wiper blade. FOR: SEAT ALTEA XL 2016-ONWARDS. REAR SIDE:10" 250mm. YOU ARE BUYING ONE REAR WIPER BLADE FOR ONLY 8.99. REAR wiper blade. Note: Single Rear Wiper Blade. Blade Length: 28 cm / 11 in. Wiper Blades. Vehicle: Seat. Position on Vehicle You can use us for headlights, rear lights, door mirrors, mirror glass and covers as well as a constantly developing range of performance lighting. 2nd Blade Length [mm]::650. We will always attempt to rectify the issue as fast as possible! We just want you and your car to be happy! 12 months warranty on all orders. You'll have the part ASAP. Eg, Vetech, Erst Klassig, Franzen, NK, etc. One Rear Blade To Fit SEAT Altea and Altea XL 2004 to 2009. SEAT Altea 2004 to 2009. SEAT Altea XL 2004 to 2009. Seat Altea (Incl. Front Set:A958S -(Driver: 65cm \ 26in - Passenger: 65cm \ 26in). To Fit:Seat Altea (Incl. Bracketless Bosch Aerotwin windscreen wipers can be seen on more and more new models. Bosch was the first to market with a bracketless wiper blade - Aerotwin. ). Patented beam technology for a uniform wipe. Wiper Blade Set. Bosch A330H Wiper Blade - Single. The Bosch Rear Wiper Blade A330H is made from plastic with dual wiper rubber manufactured to match specially styled rear wiper blades. Rain and dirt quickly turn the rear window into a visibility and safety risk. Seat Altea / Altea XL: 2005 Onwards. Seat Toledo: 2004 - 2009. Aero Flat windscreen wiper blades naturally adapt to the contours of your windscreen. Fitting instructions included on reverse of box. Aero Flat Wiper Blades. - Aero Flat Blade Concept. - Aerodynamic Fin. Blade length [mm]::280. 12 months warranty on all orders. You'll have the part ASAP. We just want you and your car to be happy! Eg, Vetech, Erst Klassig, Franzen, NK, etc. We will always attempt to rectify the issue as fast as possible! Wiper Blade fits SEAT ALTEA MPV - 04> - 574300. FOR SEAT ALTEA. This is an original quality part manufactured by Bosch. Quantity Unit:Set. Quantity Included:2. Part specifications. You will soon enjoy its durable, strong and flexible features. Land Rover. Each wiper blade is put under a competitive wipe quality test. Fit 96% of the EU car park. Direct 2 Public. All the information we have regarding the fitting is stated above. Designation Wiper blade Aerotwin, set. SEAT ALTEA TOLEDO. Length 2 650 mm. Length 1 650 mm. Curved wiper blade No. Wiper blade version Flat bar wiper blade. New Land Rover Freelander 2.0 TD4 00-06 Rear Exhaust Silencer Back Box - LR188W.GBP 29.50 View Item. Champion Spark Plugs. 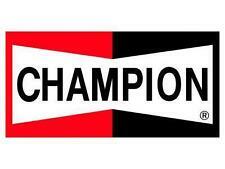 Champion Glow Plugs. That's all you need from a no-nonsense product range that will fit almost any car including models with standard wiper blades. Blade Length330mm / 13 ". Blade Type: STANDARD. The motorists' choice for best visibility and maximum safety: Readers of the magazines "Auto Motor und Sport" and "Auto Bild" have voted for Bosch as the best make in the "Wiper blade" category again. Wiper Blade fits SEAT ALTEA MPV - 04> - 574282. Wiper Blade fits SEAT ALTEA MPV - 04> - 574271.